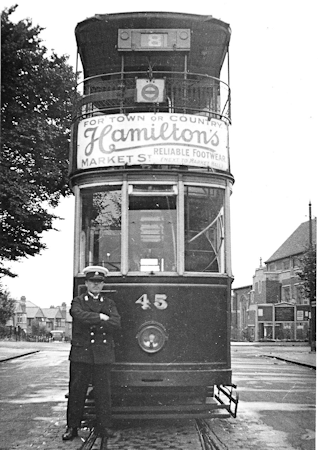 Tram 45 is seen here at the Earlsdon Terminus. St Barbara's church can be seen on the right and the houses at the top of the "posh" end of Rochester road are on the left. St Barbara's was not completed until late 1931 and the old style destination boxes had gone by 1935. The large tree was one of a line of long-gone elm trees inside the fence of Rochester House, which itself was demolished in the 1960s to make way for two blocks of flats. After the war, waiting bus passengers were able to shelter under the elm trees with ample time to cross to the bus stop when a bus approached.